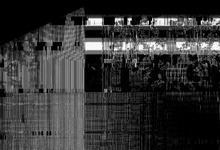 Information of decay~ is a visual and acoustic examination of the aesthetic potentialities of interim noise within deconstructed and distorted interiors. Noise serves at the same time as a medium for transporting information and communication between the visual and acoustic levels. Its modulations have been randomized, resulting in various kinds of extreme disturbance and interference. The audio synthesis is based on non-linear systems of mathematical equations, and the acoustic signals are structured by means of generative algorithms that change constantly throughout the animation. Thus, while the acoustic level is generative, the visual level is designed to be non-generative. Despite the signal´s intentional autonomy, information of decay~ directs the viewer´s attention at the creation of the contingent aesthetic couplings and interference that are, ultimately, impossible to plan or program.